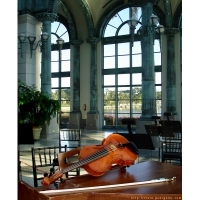 A viola and bow atop a harpsichord form the focal point of this elegant Music Room, as the scenic background view outside the arched windows enhances this photograph. The rehearsal has ended, the music stands wait unoccupied, and it’s easy to imagine the recital or concert about to take place in this intimate setting in a few hours, at duskl. This is an image that’s sure to please any classical and chamber music lovers. You can buy this design now on a card, print, poster, shirt, mug, bag or other quality gift or apparel item, exclusively from Bratsche’s Viola Bazaar!